Your project is going well. You are mostly on schedule and on budget. There have been a few minor problems, but your risk plan anticipated them, so you were able to quickly react and recover. This project is headed for success. Then the edict comes down. What are they thinking! You have a major review at a vendor scheduled for next week! If you postpone that, it will set your project back at least a month!! And your major supplier on the critical path is scheduled to ship in two weeks!! This will cause havoc with the schedule!!! It will create extra costs for delays and expedites!!! THOSE IDIOTS!!!! Stop, take a deep breath. Don’t take this personally. (Unless you backed into the CFO’s car in the parking lot last week – then it might be personal.) In all likelihood the business is doing some “financial engineering” as it prepares to close out the fiscal year. Every financial transaction in business has two equally important attributes – the amount and the timing. The date of the transaction is as important as the amount when it comes to preparing financial reports. Financial reports are either for a period of time, such as the Earnings Statement which is for a quarter or fiscal year; or for an instant in time, such as the Balance Sheet which is for a specific date. When the transaction occurs will determine which report the transaction is recorded in. It is often much easier change the date of a transaction than it is to change the amount of the transaction. I have often been asked to delay expenses near the end of a quarter or year. I have also been asked at times to accelerate expenses into the quarter or year. In both cases, we are managing the date of the transaction, not the amount of the transaction. One other point about timing. The date for a transaction can be set either using the cash basis or accrual basis. The cash basis sets the date when the money changes hands. The accrual basis sets the date when the responsibility for what the transaction represents is transferred – such as the product is shipped or the material is received. Most businesses use the accrual basis. That way, if cash payments are hung up for some reason, the sales and costs are still recorded and a true reflection of the business activity will be shown in the report. The differences between the cash and accrual basis can be reconciled by analyzing the Cash Flow Statement. Senior management must often forecast what they think will be the profit for the upcoming quarter or year. If the actual amount is significantly different, the owners and investors begin to worry that management doesn’t know what is happening. Therefore, senior management carefully considers the forecast they provide and they attempt to manage the business so as to meet the forecast. But life happens. Inevitably something occurs to cause the numbers to be different than expected. There is an unexpected economic downturn. Competition surprises the market with a new product. The cost of raw material is higher, or lower, than expected. Let’s look at the major elements of the Earnings Statement, which shows the profit earned during a time period. We want to see what can be done to influence profit as we approach the end of the fiscal year. We will assume that Finance has done a preliminary analysis and determined that the company may miss its profit forecast and is trying to find a way to increase profit. Our timing is set using the accrual basis. Revenue: This is sales in the marketplace. A company can increase sales near the year end through a promotion. But that may take time to set up and often results in less profit because of the cost of the promotion or discount. So that doesn’t help to increase profit in the short term. COGS: The Cost of Goods Sold is the variable cost associated with the product. It is the raw material and labor required to make product, or deliver the service. There are two things that contribute to this cost, volume and design. With respect to volume, if we sell more we must make more, if we sell less, we don’t need to make as many. However, in the short term, we must follow the sales orders. With respect to design, we could redesign for lower material costs or less labor, but that will take time to do the redesign, and if we are one month away from the end of the fiscal year, there is little that can be changed. So this doesn’t help us increase profit in the short term either. Fixed and Overhead Cost: When we consider the operating expenses of the business, we find that they behave in several ways. One is as fixed and overhead costs. These are costs that are required to run or sustain the business. They will not change based upon the day-to-day business activity. For instance items like rent, insurance, debt payments, or business license are typically based upon contracts or regulations. And business overhead functions such as the HR department, the IT department, the mail room, or the security guard are required to be at work whenever we open the doors. These can only be changed through business restructuring, which again cannot be done in the short term. Project and Program Cost: Which brings us to the last category, projects and programs. These are the expenses required to complete project and programs. These are normally scheduled based upon the project schedule, not the fiscal calendar. The fiscal calendar is something that management can’t change. However, a project schedule can be changed with a phone call from the project sponsor to the project manager. These are the only costs that can be changed in the short term. So when Finance determines that the company needs more profit to meet its forecast, it is projects that get the call to stop spending. 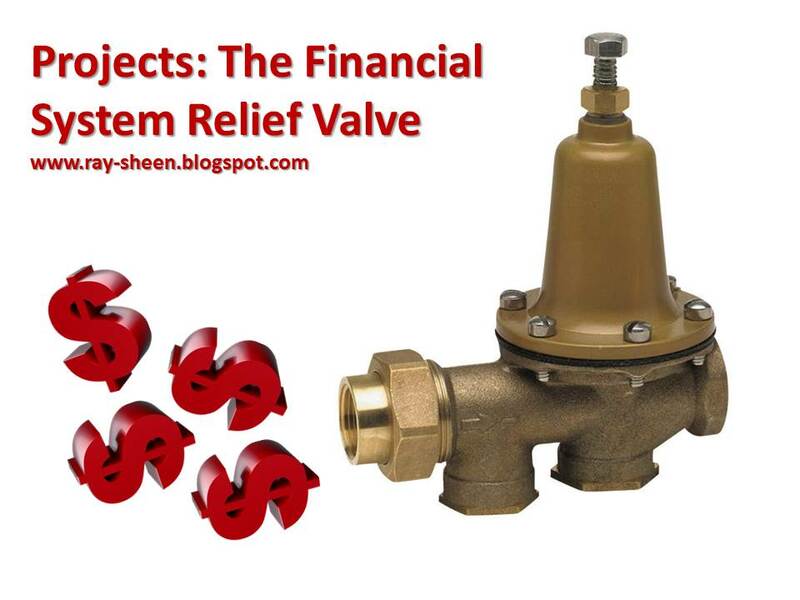 Projects are the financial relief valve for the business as it nears the end of a fiscal quarter or year. And if the year is going better than expected, the projects may be asked to accelerate spending. Yes it impacts the project schedule, but the project is sacrificed for the greater good of the business. In many cases, tell a project manager they must use earned value analysis on a project and you will hear a groan. Earned Value Management has been tainted with an aura of overwhelming bureaucracy and incomprehensible numbers and ratios. While some organizations may have done their best to confuse and confound project managers and project teams with Earned Value Management – it is really a very basic and easy to use set of project analytics. This blog post will explain the earned value project forecasting analysis and other blog posts will discuss project baselines, variance analysis, and cost account managers. Or get everything in one ebook that can be ordered below..
Earned value management is an analytical approach for determining the current cost and schedule status of a project and for forecasting the final cost of a project. It combines scope, schedule and resource management into one set of measurements. When used properly it will simplify and reduce the effort needed to provide effective project management control. Earned Value Management is based upon the comparison of three different perspectives on a project. The first perspective is the project planned value (PV) which is the estimated cost of each activity time phased according to the project schedule. The next baseline is the earned value (EV) which is the estimated cost of the project activities that have been completed. The final baseline is the actual cost (AC) which is the amount of money spent completing the work that has been done on the project. 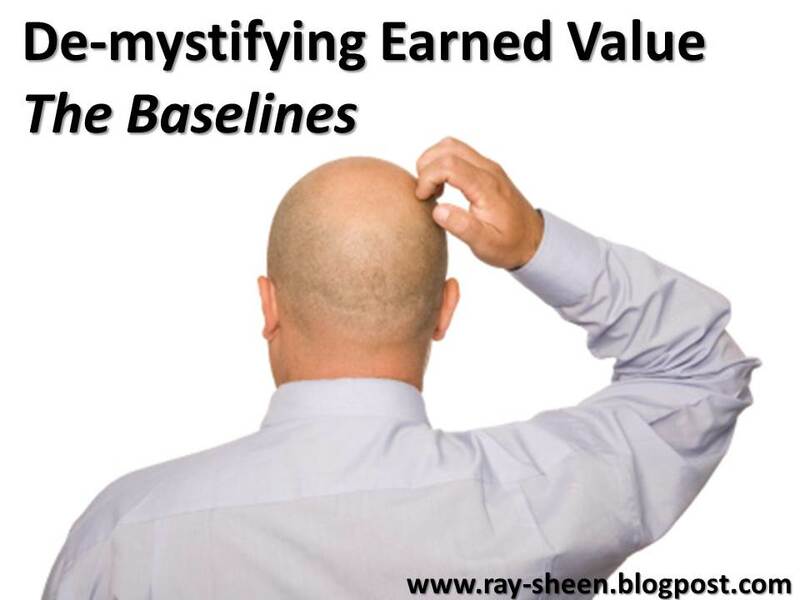 These baselines are discussed in more detail in the blog post, “Demystifying Earned Value – theBaselines." On the one had we could say the original baseline project plan is a forecast. However, in project management terms, forecasting is normally providing an updated estimate from the original plan. I recommend that this be done at the beginning of each phase. It may also be done following a major high risk milestone. I recommend starting the forecasting when the project is 20% complete. By that time several significant items should be completed on the project and enough work is done so that a small underrun or overrun is not magnified out of proportion. Prior to that time, the baseline plan is the forecast. The key then to effective forecasting is to be able to calculate a realistic ETC (since AC is already occurred and cannot be affected). To assist the project manager in the calculation of ETC, the Earned Value Management methodology creates several performance indices. These indices consider what has happened on the project since its start. There are two indices, a Cost Performance Index (CPI) and Schedule Performance Index (SPI). The CPI is a ratio of the earned value (EV) divided by the actual costs (AC). Since the EV is the estimated cost of the work completed and the AC is the actual cost, the CPI is a ratio of underrun or overrun for the work completed. The index can be calculated for the entire project or for a subset of tasks, such as all of Phase 3, or all the tasks performed by the IT organization. The SPI is a ratio of earned value (EV) divided by the planned value (PV). Since the EV is the estimate for the work completed and the PV is the estimate for the work that was planned to have been completed, it is a ratio of ahead or behind schedule. Again the index can be calculated for the entire project or a subset of the project tasks. The first method is to create a new estimate. In this case, the project manager and core team create a new estimate for all uncompleted work. This often done if there is a major scope change to the project. I also will use this approach when near the very end of the project because I normally have an excellent understanding of what is left to be done. The formula for the project estimate is: EAC = AC + (new estimate for remaining work). The second method is to stick with the original estimate. In this case the ETC is the originally budgeted estimate for the remaining work. This is a good approach to use when any underruns or overruns that have occurred were due to unique or isolated events and are not likely to be repeated on the project. This is calculated as the Budget at Completion (BAC) which was the total for the planned value and therefore the original estimate of all work, minus the EV (original estimate of the work that has completed). The formula for the estimate of the remaining work is: ETC = (BAC – EV). The formula for the total project estimate is then: EAC = AC + (BAC – EV). The third estimating method is used when established trends on the project will continue. This method requires the use of the CPI performance index. It assumes that any pattern of cost overruns or underruns that has been occurring on the project will continue to occur at the same rate. It can be applied to just a subset of tasks, or the entire project. The estimate created in this method will take the originally estimated value of the remaining work (BAC – EV) and divide that by the CPI. This has the effect of increasing or decreasing that value of the remaining work by the same ratio that it has been increasing or decreasing. The formula for the remaining work is: ETC = (BAC – EV) / CPI. The formula for the total project estimate is then: EAC = AC + (BAC – EV) / CPI. The fourth method is used with projects that are behind schedule and must be accelerated. It requires both of the earned value performance indices, CPI and SPI. This method assumes that the underrun or overrun pattern will continue and that an effort will be made to finish the project on the original date, so increased costs will occur to accelerate the remaining work. To create the acceleration effect, the estimated cost of the remaining work (BAC – EV) must be divided by the SPI. The ETC in this case then must include an effect for both cost and schedule. The estimate for the remaining work is: ETC = (BAC – EV) / (SPI * CPI). The estimate for the total project becomes: EAC = AC + (BAC – EV) / (SPI * CPI). Which method you use will depend upon the project conditions. However, in each case the math is straightforward if you have the earned value metrics. If you want to learn more about earned value, order my ebook below. In many cases, tell a project manager they must use earned value analysis on a project and you will hear a groan. Earned Value Management has been tainted with an aura of overwhelming bureaucracy and incomprehensible numbers and ratios. While some organizations may have done their best to confuse and confound project managers and project teams with Earned Value Management – it is really a very basic and easy to use set of project analytics. This blog post will explain the earned value variance analysis and other blog posts will discuss project baselines, project forecasting, and the role of the cost Account Manager. Or get everything together in the ebook found at the end of this post. Projects hardly ever go exactly according to plan (at least I have never had one that went exactly to plan). Some things go better than expected, some go worse. Some tasks start early, some late, and some are just different. Variance occurs when the actual situation is different from the planned or expected situation. In projects, variance analysis applies to schedule variance and cost variance. Variance analysis helps the project team understand why things are different than expected, and more importantly, what they should do about it, if anything. Variance is always backward looking. It analyses what has happened. (We will cover forecasting in another blog.) We typically are concerned with two different time horizons when determining project variance. One is the variance since the start of the project, known as cumulative variance. This variance will be focused on trends. The second is the variance in the current month or week. This is focused on recent occurrences. Most earned value reports will show both variances. Cost variance is the under-run or over-run of actual costs (AC) as compared to the estimated project costs of the work that has been completed (EV). When evaluating project cost variance, it is important to exclude the effect of tasks that are ahead or behind schedule, which is why EV is used instead of PV. The PV has embedded schedule assumptions for which tasks will occur in which months. If a task is not worked on during a month because of a schedule delay, that could appear to be an under-run to the project for that month if we use PV. However, if the task is accomplished the following month, it would appear to be an over-run for that month since the cost occurred in that month without any planned cost for that task occurring in that month. The Earned Value Management approach allows us to eliminate the schedule impact on cost variance by using EV for the baseline cost instead of PV. The EV represents the planned or budgeted cost for the work that has actually been performed. The AC is the total costs associated with doing that work. Cost variance that is calculated using EV and AC from the beginning of the project is the cumulative variance. It is an excellent indication of trends and helps to predict what will likely continue on the project unless changes are made. However, the amount of the cumulative cost variance – either under-run or over-run – is typically unchangeable. Most of those tasks are completed and the variance cannot be impacted. The current period cost variance analysis will provide insight as to whether the tasks that are currently underway are over-running or under-running. These are indications of immediate risks and opportunities that the project manager should investigate. The cost variance is calculated as the difference between EV and AC. A positive cost variance is an under-run and a negative cost variance is an over-run. Current period cost variance uses the EV and AC for the current month. Cumulative cost variance uses the EV and AC since the project has started. The earned value analysis schedule variance is the estimated cost of the work that has not been done according to the project schedule plan. For work that is accomplished earlier than scheduled, this would be a positive value representing the estimate of the work accomplished early. For work that was late this is a negative value representing the estimated cost of the work that was not done when scheduled. The schedule variance is then the difference between the EV, which is the estimated or budgeted cost of the work that has been performed and the PV which is estimated or budgeted cost of the work that should have been performed according to the project plan. The primary concern for a project manager is negative schedule variance. This is cost that will need to occur at some time on the project when those project activities finally occur. This becomes important near the end of a fiscal year when the business is trying to plan the costs that will occur in both the current year and the following year. 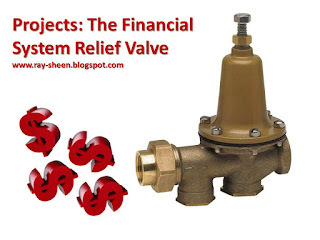 Keep your finance people informed if you have large earned value schedule variances. Just as with cost variance, this can be calculated both for the current month and for the entire project since its start. Variance analysis is easily calculated using earned value management and the three earned value baselines. Forecasting using earned value will be discussed in another blog. 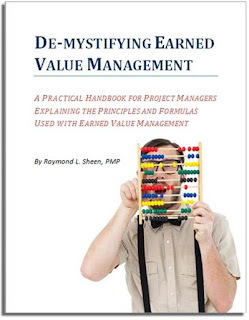 If you would like to find out more about earned value management, order this ebook. In many cases, tell a project manager they must use earned value analysis on a project and you will hear a groan. Earned Value Management has been tainted with an aura of overwhelming bureaucracy and incomprehensible numbers and ratios. While some organizations may have done their best to confuse and confound project managers and project teams with Earned Value Management – it is really a very basic and easy to use set of project analytics. This blog post will explain the earned value baselines and future blog posts will discuss variance analysis, project forecasting, and the role of the cost account manager. Or you can get everything in one document by ordering the ebook at the end of this post. Earned Value Management is based upon the comparison of three different perspectives on a project. The first perspective is the project plan – to include which tasks will be completed on which dates and how much they are estimated to cost. Earned Value Management calls this the Planned Value (PV). The second perspective is the current project schedule achievement – which is an assessment of which tasks are started; which tasks are completed; and the level of progress for those that are underway. Earned Value Management calls this the Earned Value (EV). The third perspective is the current project spending – which is how much money has been spent on the project since it started. Earned Value Management calls this the Actual Cost (AC). 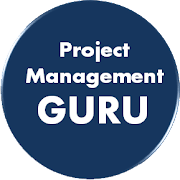 The project manager should be managing all three of those perspectives regardless of whether Earned Value Management is being used. The PV is created using the Work Breakdown Structure (WBS), the project schedule, and the task estimates. Every task in the WBS is assigned a separate account number in the financial system. The cost estimate for every WBS task is then spread over the time periods (normally months) associated with the project schedule for that WBS task. Those cost amounts are placed in the WBS account for the appropriate periods to create a time-phased task-level budget estimate. This is the task PV. Once all of the task PVs are complete, they can be summed into a project PV. When spreading the task estimate across multiple time periods, one of two techniques is used. The cost can be “level loaded.” This means the costs are spread evenly across the time periods in which the task is scheduled to be accomplished. The other approach to spreading the cost is “event loaded.” In this case, the WBS task is planned at a micro-level (daily or weekly) and the cost associated with the work for each micro-time period is assigned to that period and then summed to the time periods used in the financial system (normally monthly). PV is expressed either as “Current PV” which is the PV that is planned for a particular month, or “Cumulative PV” which is the PV from the beginning of the project to the point in time under consideration (normally the current date). The final value of PV – that is the total PV for the project – is the Budget at Completion (BAC). Earned Value (EV) is a judgement call by the project manager and the project team concerning how much of a task has been completed. The total possible earned value for a task is based upon the original budget estimate for that task, which is the task Planned Value (PV). The percentage of a task that is completed is the percentage of value that has been “earned.” If a task is 50% complete, the task has “earned” 50% of the planned value – regardless of the cost required to get to that point. Before a task is started, its EV is 0 since none of the planned value has been earned yet. When a task is complete, it has “earned” all of the value for that task, so the EV = PV. EV for a task can never exceed the PV for a task, regardless of how much has been spent. Nor can EV ever be negative. Earned value amount is based upon the number of micro-tasks associated with a task that have been completed. This requires detailed task planning at the micro-activity level. This will be the most accurate, but it also takes the most work. I normally use this approach for tasks that take longer than 2 months to complete. 0-100: The earned value amount is zero until the task is complete, then the EV is 100%.of the PV. This is easy to use and focuses team members on getting things done. However, they are likely to start and do the easy tasks first and save the long and hard tasks for last. It is best used with tasks of one week or less duration. 30-70: The earned value is set at 30% of the PV when the task starts and the additional 70% is credited when the task is completed. This approach is easy to calculate. It is not quite so harsh as the 0-100 approaches. I normally use this for tasks that are longer than a week in duration but less than 2 months. The AC element of Earned Value Management is the easiest for the project manager. The business financial system collects costs. As long as the project earned value cost accounts are created when the project PV baseline is set and the financial system can record costs by those account numbers, the AC will be automatically collected from the finance system. With these three project perspectives, PV, EV, and AC, the project manager can determine the underlying causes of cost and schedule variances and forecast project completion. These topics will be discussed in future blog posts. 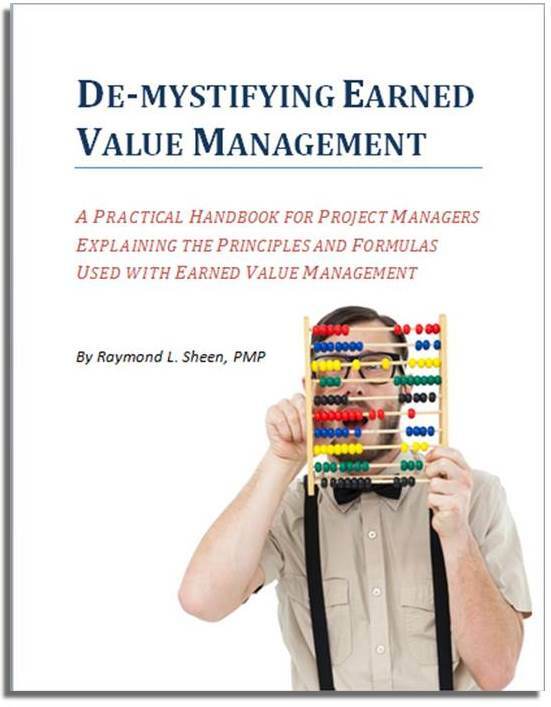 If you would like to find out even more about earned value management, purchase this ebook. As an engineer, I like math. In fact, an argument can be made that engineering is just the science of representing the physical world through mathematical formulas. Through these mathematical formulas, we engineers understand how to make airplanes fly, or communication systems connect people around the world. We know how to manage an electrical power grid, build a bridge that supports hundreds of cars and trucks, or build an artificial heart that will keep a person alive for many years. Engineers also know that some of the mathematical formulas that represent the real world are discontinuous functions. That means that a graph of the formula will show a line or surface with gaps and edges. The formulas help us understand that some conditions are impossible. There are also some conditions that cause the formula to make a sudden jump. With just the slightest change, it goes from one extreme to the other extreme. Discontinuous functions are particularly interesting at the point of discontinuity. So what does that have to do with project management? Well, a common failure of project managers, Project Management Offices (PMOs), and senior management is to ignore this characteristic of the real world as it applies to projects. Projects also experience discontinuities which at an instant in time can totally change how the project must be completed in order to meet the project objectives. There are likely to be discontinuities within all three of the major project constraints. Scope discontinuities occur when unplanned work must be done, or planned work is not needed. Schedule discontinuities occur when estimates are wrong, when resources are not available as expected, or when an external event changes project priority. Resource discontinuities occur when resources are changed – either the cost of resource or the capability of the resource. There are three implications of this for project managers. One involves the plan, another involves risk management, and the third involves project control. Let’s look at each. The project plan is the project management team’s intent for how the project activities should be completed in order to meet the project objectives. The plan is needed to communicate with team members and stakeholders what is to be done, when it is to be done, and who is to do it. Whether following a traditional, adaptive, or agile approach to project management, project planning is integral to the discipline of project management. But these project plans typically ignore the discontinuities that happen in the real world. 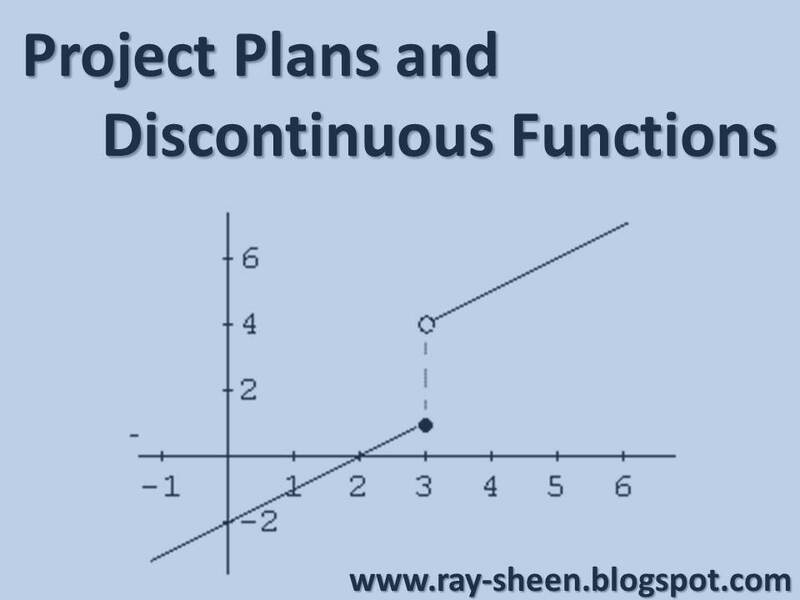 Because of these discontinuities, the project plan is almost always wrong. It could be that a new task or activity is required; an estimate is inaccurate so a milestone date is wrong; or a resource is changed impacting both timing and cost of an activity. Regardless of the reason, the project does not stay on the plan – a discontinuity occurs. Many of these discontinuities are predictable. The discontinuity has occurred frequently in the past. The danger for project teams and PMOs is that they believe that the project plan is fully accurate. This leads to a blind spot when it comes time to change the plan to accommodate the discontinuity. 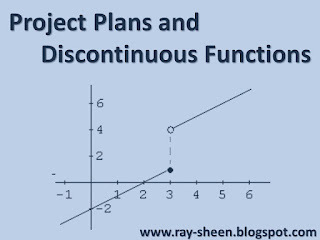 Many projects operate in a phased manner and my rule of thumb is that I assume the plan will need to be changed at the end of each phase because of discontinuities discovered in that phase. Experienced project managers know the value of upfront risk management. They analyse potential risks and embed appropriate activities and resources in the project to mitigate the risk. This is a best practice. But too many project managers treat this as a one-time activity to be done at the beginning of the project. They don’t do regular periodic project risk reviews or updates. They may address the already identified risks at a project review; but they seldom go looking for new risks. However, whenever discontinuities occur, there is a risk – either threat or opportunity – to the project. While some discontinuities are predictable, some are not. We can’t predict when the critical resource will break their leg skiing. We can’t predict when the key supplier will be shut down for an environmental permit violation. We can’t predict when a test will go much better than planned, eliminating the need for further development. The project manager should be continually checking the project and the project environment for discontinuities. This is especially true for positive risks. There is usually someone who is quick to point out a new negative risk, but the positive risks opportunities are overlooked. Establish the habit of frequent reviews of new project risks. In many cases, I have seen the project risk register more than double in the total number of risks from the time of approval of the project plan until project closeout. This points us now to the third aspect of project management that must be prepared to address discontinuities. Project control activities are used by the project team to review progress against the plan, forecast the remaining project activities, and then take appropriate actions. Well we have already seen that the plan is wrong due to discontinuities and that the anticipated risks are incomplete because of discontinuities. So it is no surprise that while performing project control activities, discontinuities are identified and analysed. Typically when a variance is recognized during project control, a corrective action is implemented to get the project back on track. But discontinuities may represent insurmountable hurdles to getting the project back on track. Remember though, the project manager’s job is to achieve the project objectives. When a discontinuity is recognized, the project control activities should be focused on controlling to the project objectives, not to the artifacts of the project planning processes or risk management processes. This means that a project manager will often have to say at some point, “Our approach is wrong, we need to change it to achieve the project objectives.” A project manager who cannot admit that their approach is wrong, is one who will not be able to adequately respond to discontinuities. As I mentioned earlier, the discontinuity is the interesting point. The project manager must be aware of discontinuities and flexible in their approach to the response. The nature of the discontinuity will determine the correct response.